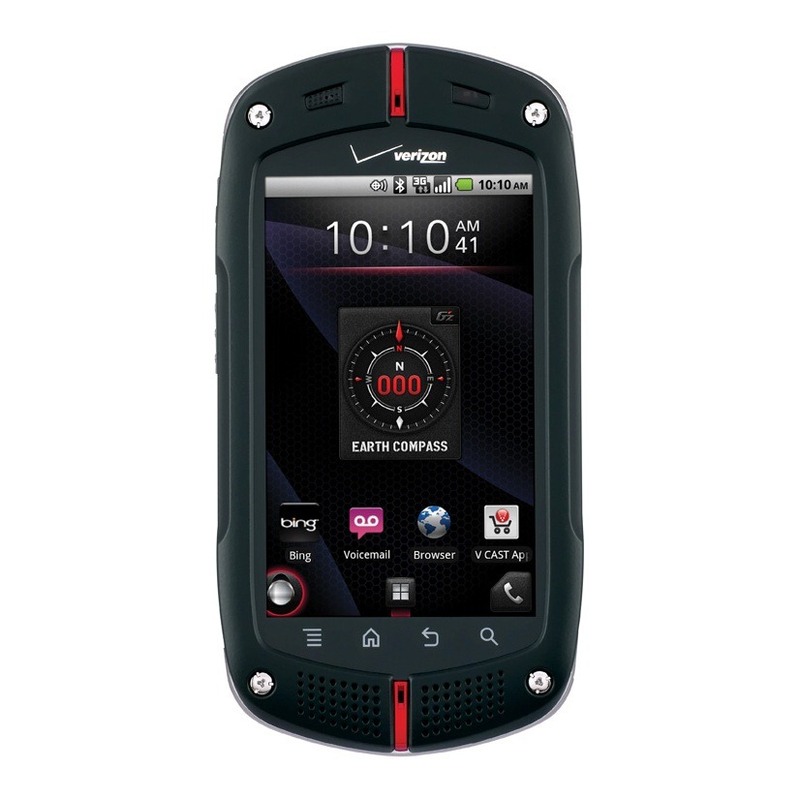 The DROID Incredible 4G LTE came out in 2012, and it hasn't received an OTA since that year. The phone was less-than-stellar at the time, and since its hardware was worse than its software, an update can't do much to turn it into a better device. That said, if you already own this quirky handset, be on the lookout for a notification bringing with it a handful of enhancements, such as ISIS Wallet support, reduced power cycling, and some security patches. 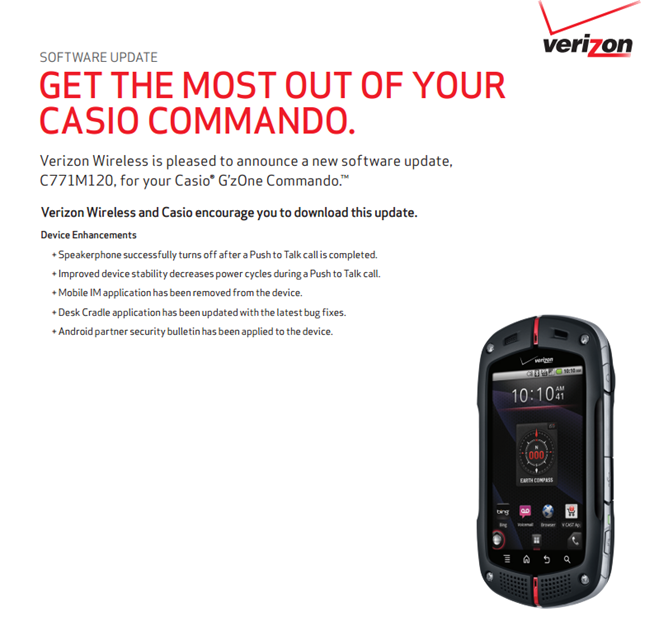 Remember Casio's take on the rugged smartphone, known as the G'zOne Commando? It seems that while everyone else on the planet may have forgotten all about this little guy, Verizon has somehow managed to squeeze another software update out of Casio for this all but forgotten loner. Speakerphone successfully turns off after a Push to Talk call is completed. 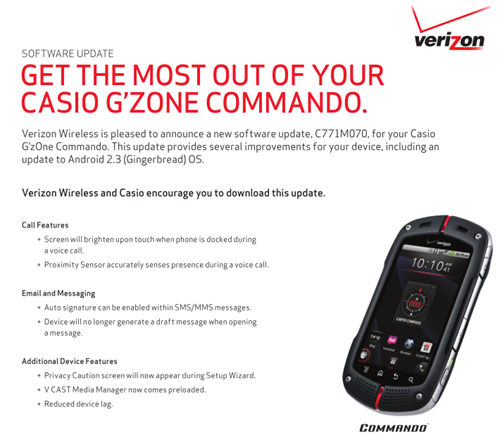 If your rough-and-rugged style made the Casio G'zOne your perfect Android counterpart, then we have good news for you: Gingerbread is on its way to your little tank-of-a-phone right now. Auto-signature can be enabled within SMS/MMS messages (but on behalf of everyone in the world, I would like to ask that you don't use this feature. April 28th is going to be a big day at Verizon for Android lovers, as three new phones are scheduled to hit the sales floor, adding even more choices to the already vast lineup of VZW Android powered goodness. First on the list is the Samsung DROID Charge. 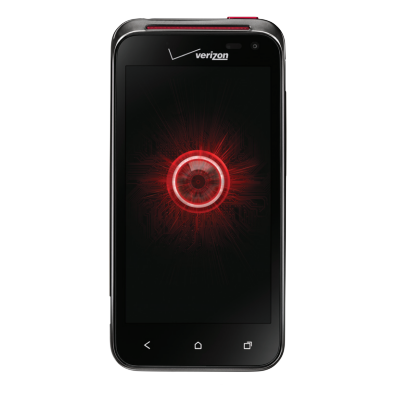 I realize that we've known the release date for several days, but it's definitely worth mentioning again since it's the first 4G phone to carry the DROID tag and will most likely take its place as the new flagship phone for VZW.